The book starts strong and ends strong. 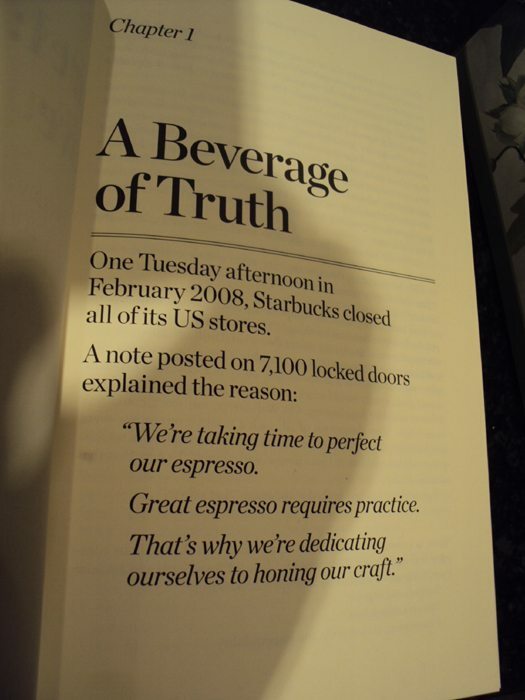 One of the beginning stories involves how Starbucks closed all their stores in February 2008 for Espresso Excellence training of their baristas. We learn that this was an early step in delivering a more consistent beverage to customers. Your drink should be perfect no matter which Starbucks you visit. “If not checked, success has a way of covering up small failures, and when many of us at Starbucks became swept up in the company’s success, it had unintended effects. We ignored, or maybe we just failed to notice, shortcomings. For those who are curious, MyStarbucksIdea.com was originally dubbed “Project Greenstorm” during the internal development phases. Most of the book covers the years 2008 and 2009. These were years full of moments of emotions, angst, fear, pain, and success. 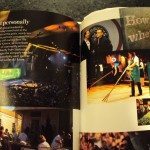 The section of the book on the 2008 Leadership Conference is called “A Galvanizing Moment” and it’s extremely heartwarming to read. It’s amazing to think of the sheer volume of work done by partners in New Orleans to help restore that city, and just as importantly, the commitment Starbucks made to Leadership Conference during a time of financial uncertainty. Starbucks partners planted 6,500 plugs of coastal grasses, installed 10 picnic tables, and laid four dump truck loads of mulch. They painted 1,296 steps, 12 entrance ramps, hundreds of yards of railing, and more. They cleaned 22 city blocks of streets and storm drains. (Onward pg. 199). Chapter 28 is called “Conviction” and it chronicles the development of Via Ready Brew. In its development stages it was known at one time as “JAWS” (just add water, stir) and also “stardust.” The name of the product honors the original developer of the product, who brought the creativity and development of Via to Starbucks: Donald Valencia. At one time, before I tried Via, I too was a skeptic, but I have to admit that the incredible convenience of it appeals to me. I’ve given in, and now I join in with others as a Via fan. The book is a must read. It starts off early by even providing the reader with the genesis of the hallmark sign off phrase of Howard Schultz, “Onward.” We learn that he first used that phrase in a letter when he was operating his Il Giornale coffee house (this is now Starbucks store 101). Read Onward. Your heart might race a little, and you’ll see the human side of a big company. Switching gears a moment, I suspect that a few people reading this are asking themselves, ‘Melody, how did you get your hands on this book early?’ There is no glamorous answer. I >wish< I could say that Starbucks provided me with an early edition, but nothing could be further from the truth. (I may still try to get an autographed copy, if possible.) The answer really was simply a glitch on Amazon.de. One morning I was engaged in a twitter conversation with Sebastian Birr and HausofMarkDavid, and Sebastian alerted my attention to the fact that the Amazon.de website showed that Onward is scheduled to be shipped on the 16th. In the couple of hours that we twittered, Amazon.de fixed the mistake on their website, but not before I got a chance to order one. I paid a small fortune in shipping to quickly get the book from Germany to Seattle. I think it is a little ironic that the book came to me from some Amazon.de warehouse in Germany, when both Starbucks and Amazon.com are Seattle-based corporations. That’s the honest answer as to how I got the book early. Other people might be thinking, ‘Melody, you can’t possibly have liked or agreed with everything in the book?’ It’s quite true that there were a few moments that I cringed as I read it. Over years of posting online, both here and other sites, I’m becoming increasingly cautious about what I write. 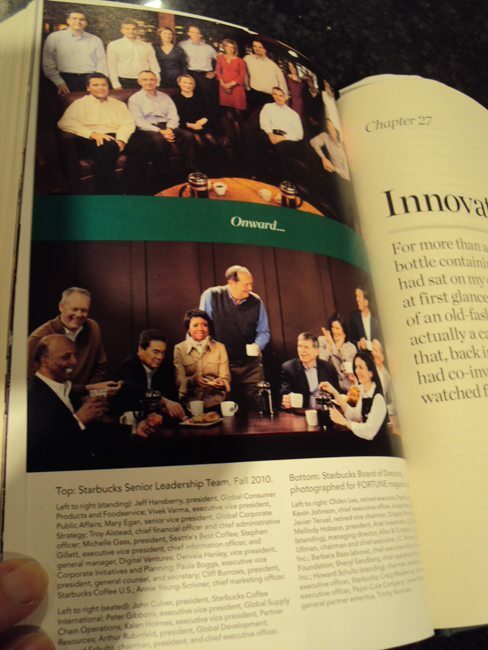 I want to be able to maintain some kind of eye contact with Starbucks executives, if I should meet them in person. 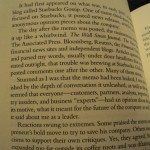 😉 There were a couple of places in the book Howard Schultz seemed to suggest that he has restored the aroma of coffee in the stores with the introduction of Pike Place Roast. He credits the renewed grinding coffee in the stores as the answer to bringing back the aroma of coffee. As I write this, Pike Place Roast is still my very least favorite Starbucks coffee, and I don’t really think that the aroma of coffee is prevalent in a typical Starbucks. There are a few other things that make me wince a little, but very few. There are blog posts starting to pop up in a number of places about Onward, and this professional’s blogger take on it is quite interesting! I can’t really agree with that, but certainly think it’s an interesting perspective. I hope you’ll read the book too, and tell me what you think. Do you recognize these old Starbucks coffee training cards? Shining a Spotlight on Starbucks Breakfast Blend and Milder Dimensions. @Purple1: yes, that’s alot of what I meant…..the interest is missing. Maybe some of it due to their age, as I said…they don’t really know what it used to be like…..but also just a lack of interest (generally, SOMETIMES, etc) They have often not seen how much Sbux came and went so I don’t think they cherish much of the whole Sbux idea that most of us do. That’s a perfect example, what you write. Whle the baristas and manager at my regular place are all very kind and good at what they do, most of them are way too young to grasp what some of this means….. to us. Obviously, I’m guessing this is an age-old issue….. generation after generation, about something or other. 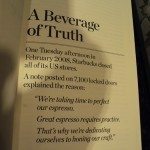 @DeniseR and @purple1 – The young age of partners is one more reason that Starbucks could stand to improve at telling their own stories. It’s easy to meet partners who really haven’t experienced much with Starbucks and don’t remember the Starbucks of yesterday. 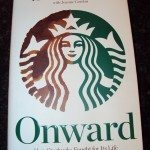 What would be most meaningful is not just that partners read Onward, but reading both books (Pour Your Heart Into It and Onward) really would give someone the sense of how much Starbucks has changed and the ways they’ve grown! Melody have so many thoughts re your recent response. From the response I got this morning to the question of the partner book, I really am not too confident that the partners will read the book. Also, I agree with what you said, but on the other hand I think there has to be a new direction in training or to say the least training to where it once was when partners were more passionate. I am not sure if reading the books will give the partners the connection to the old SB or to revive the customer service. I guess perhaps a broken record on my part but I still wonder what the current views of corporate SB is towards customer service. 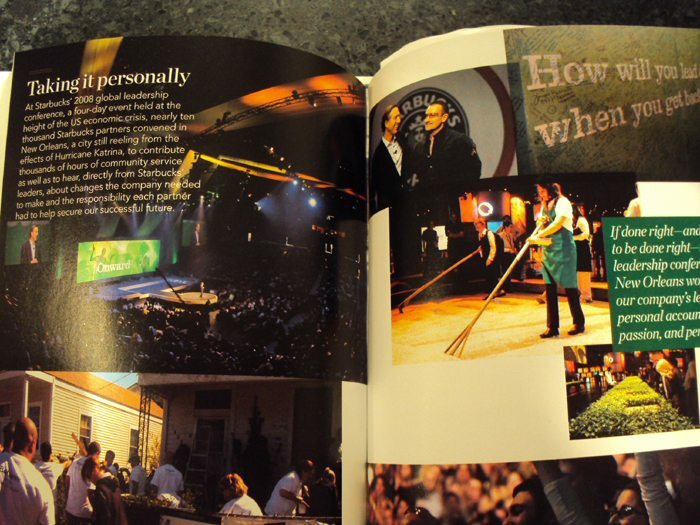 More than most brands, Starbucks is a place where stories are created and told. First, your blog is unique for sure. Second, SB would totally ruin the emphasis of this blog and the community you created. Look at the turnaround and problems with MSI. I know I am being a bit too serious perhaps. I really think that SB can never create this type of blog. I’m 53 years old and have worked for Starbucks for almost 2 years. Although the book is well written i found it hard to read. I’m a barista and often feel treated like an indentured servant. I have worked in 7 stores (4 home stores and 3 as a borrowed partner) and have yet to see anything resembling anything i read in “Onward”. Perhaps the “servant leaders” are feeling the passion Howard repeatedly refers to. I have talked to my manager and DM about this in the past and feel its time to address this again. I chose to work at Starbucks because of a book i read called “How Starbucks Saved My Life”. Its basically about a high brow business executive who loses his job and finds fulfillment and a new life path working for Starbucks. I had no idea how far off the book was until I spent some time at my first store. i received no training for the first month. I was then transferred to another store for training. I received cursory training there and was then transferred to a store an hour and a half away by bus. The manager at this store was eventually demoted and i was again transferred to yet another store. Fortunately this one is within walking distance. This one is just as badly managed. The staff are treated disrespectfully and are understandably disrespectful in return. As soon as the manager turns their back the staff goof off. Although my store is just around the corner I never go there, except to work. I request take out cups and cutlery because our glasses and cutlery often have residue on them. There is no morale or discipline in the store. Our staff are rude to customers. Nowhere do i see the passion Howard talks about. i store often smells of burnt cheese or urine. Our sales are the lowest in the district. Although its only 8 months old it has the dirt and filth of a sore many years older. It has been hard to witness so many missed opportunities. I should state that I am a professional with three undergraduate degrees and a masters of business and a pedigree of business success. When i became a partner I was expecting to see the model of precision I had read about in the ten or so books I have read about Starbucks. I have seen exactly the opposite. You may wonder why I have stayed a barista despite constant nagging to become a shift and ASM. I have chosen to stay as a barista so i could actually see what its really like and i can say its been quite an education. I honestly hope every “partner” reads Onward. Maybe someone close to Howard will tell him he’s not wearing any clothes. I do not feel, like nor have I ever been treated like a “partner” while at Starbucks. I will be terminating my employment with Starbucks when I reached my second anniversary and i suspect no one will even notice. Norm thank you for taking the time to share your experience as a partner. It is sad that you have experienced this at the various SB locations, however, as a loyal customer I have seen some of what you are speaking of from my side of the table. I understand why you did not want to advance beyond being a partner, but your background and experiences might have been an asset at the ASM or SM level. I hope you might reconsider resigning and provide the SB store with ideas and training that could turn it around. I do agree on some level that what HS writes about in his book is not acted out in the field and at every SB. But, as you and others have said, it depends on the staff, location and even the customers. @Norm – I owe you a thoughtful reply but I’m hurrying out the door, nearly late for work, at the moment. 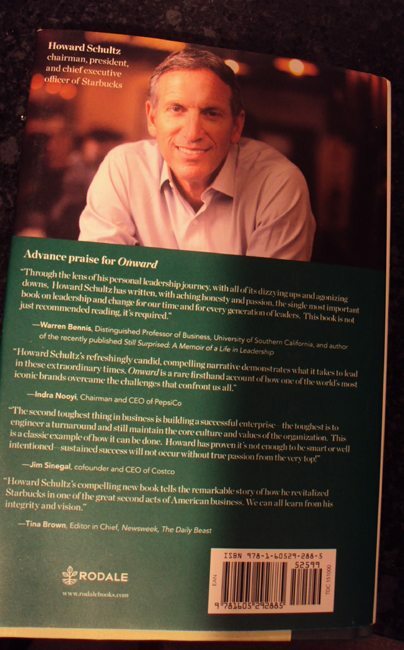 I do know that there is an Onward Book Tour going on with Howard Schultz appearing in many cities. It might be an interesting chance to really hear some inside thinking that went into the book. I have been a partner for 5 and 1/2 years. I started when I was 18 in 06, I have seen Sbux go thru it’s ups and down. I too have worked At 3 home stores and over 15 borrowed stores all over southern California. I can say that there have been times that I was doubtful that Sbux was the place for me, however I have an amazing store manager that makes us all feel like we are valued and our opinion matters. After reading this book it has reignited a fire that has been burning low in the last year. However, i still have had that passion within just needed something like this to remind me what a great company I work for. What other company would help me have full medical, 401k and stock options so I can have some net worth based on my hard work for the future? Non that I know of. I can’t wait to go back to work and put my heart into every cup of coffee I make. This book was well worth the time it took to read. I hope my customers see my renewed passion. @Norm – I’m sorry you’ve been through that. One thing I can say about Starbucks is that it seems like the further you get away from downtown Seattle, the more the ideal Starbucks store is a hit and miss thing. I’ve watched partners in downtown get trained with workbooks, and with managers standing right next to them at bar. I have talked to DMs and I think there are is an open line of communication here. @Norm – Reading both your post and Melody’s comments to your post, I am left with a quote from Ghandi: Be the change you want to see in the world. Like you, reading How Starbucks Changed My Life was a turning point for me. If your experience is not what you expected it to be, make it happen. Starbucks provides the environment and empowerment for you to do just that. Do not be afraid to step up and make the change that you want to see happen. What would have happened if Michael Gates Gill continued to hide behind his mop cleaning bathrooms? What if he had never made it to the register? Would anyone have noticed? The truth is, you have been noticed. You have been asked to be a shift and move up to ASM. Do not let this opportunity pass you by. Create and be the warmth in a dimly lit store. Melody, I’m about 3/4 finished with the book. What a great read! Like a thriller, and a romance, all wrapped up in a book about business. I met Howard once. In the mid-to-late 1980s, he needed a conference room to pitch his ideas to an investors’ club. The son of one of the potential investors was my business partner, and we offered Howard the use of the conference room to make his pitch. Thankfully, Howard’s pitch wowed the investors, and the rest is history. 🙂 Good for Howard. And I’m kicking myself for not really paying attention that day. I’ve been a Starbucks fan since the days of bulk coffee only, in Seattle with just a couple of stores. I’ve followed along. I’ve read “Pour Your Heart Into It” and I even got quite dispirited in the days when Starbucks was too busy growing to realize the customer experience was diminishing. Gosh! Now I want to work for Starbucks. With leaders like Howard, I BELIEVE in a great comeback. Now that I live in Orange County, California, I’ll have to wait patiently until there’s another hiring fair, and then I’m going to pounce upon becoming a barista! In the mean time – I’m off to visit the Clover in Irvine! ONWARD!!! I’m reading the book now, slowly. I’ve already ‘post-it-marked” several pages where I FEEL he’s not really being honest. or, is this REALLY how it happened? my own questions. I have lots of feelings about the book but onvioulsy cannot speak of it until I finish it. re: “Onward”, I was immediately struck about H.S. opinion of (what eventually became) PPR. did he really realy believe : ‘it’s smooth, like butter. Really balanced. Somewhat acidic and bright. Drinkable. Easy.” did he really really believe that it was even THAT decent??? If so, then we have far far different opinions of coffee. @denise r & @Hayley – does he like it that much or is he selling it that much? I remember before it came out how Howard waxed on about how it was the perfect cup of coffee that it did not need creme or sugar. Comparing PPR with his previously romanticized bold varieties from Starbucks and you have to wonder if it’s really nothing more than a sales job. @CD (and Hayley), I do believe it’s sales, which, to me, kind of is “LOSING one’s soul” not the other way round. His whole description of that and how ‘this is what people wanted” etc., I just found so…… UN-true. as I’ve said many times before, on msi, especially back in the days when we were all screaming for BOLD and voicing our disgust with PPR: why did Sbux feel it had to become like McDonalds while McDonalds was trying to become like (?) Sbux. and, as we’ve said: nothing smoothe to us, or “easy”, about PPR. I guess we just have different feelings about “coffee”…..and I think his (obviously) is a great deal about sales. I always found the total title of the book ironic. Perhaps my bias as a former SBUX marketer is too strong, but I found ONWARD to be very AWKWARD. The awkwardness begins with over dramatizing so many insignificant details as earth shattering business-defining moments. Perhaps the most awkward moment is the many times Howard derides how Wall Street measures the success of a company based upon short-term financial figures. Yet, Howard essentially claims victory in transforming the company because in fiscal 2010, financials for the company were at an all-time from revenue to operating income to operating margin. It’s too early and born of too much hubris to proclaim victory. I wrote more about how ONWARD is AWKWARD on the Brand Autopsy blog. I read the book a few days ago. Now that I’m finished, I did enjoy reading it, altho as I said somewhere, I post-it-noted all thru it on things I would question, or that I saw irony in. I think he probably wrote it as well as he could have, meaning….. told things that he felt he could and how he needed to tell them. I don’t think he really sugar-coated much…except the whole PPR thing and the ‘coffee aroma’. He was writing this to sell a book after all, and to tell a story. I was lucky to be able to attend a Q & A with him today at Columbia college in Chicago. For the admission ticket, you also recvd two signed copies of the book. At signing in, they said if anyone had any questions, plz put them on an index card and they would submit them to him. I wrote a couple different cards, different questions. One Q was simply: would he plz sign my Onward card…..and that I had a sharpie. I signed myself a 20+yr Sbux die-hard customer. Shortly before the event began, a woman came out into the small auditorium and asked for me. She wanted my card, he ould sign it:) Then a minute or so later she came out again and took me back into the green rm with her to meet H.S.! It was just Howard, maybe 3 guys from his team and me. Someone offered to take our pics together w/ my phone, and did, and then they ran and got the professional photographer who was shooting the event, and he came and took about 4 or 5 of us together. It was very unreal (surreal?) to me. I asked him his all time fave coffee (aged Sumatra..I told him ethiopian Yergacheffe for mine). I mentioned msi and of course THIS SITE altho in what exact context I have no idea. I also asked him if he went for a run this morning. (perfect run morning here) He didn’t. It felt like alot of contact with him, for ME! I was elated. He not only signed my Onward card but also the index card I’d written the Q on. I thanked him…. alot. Then for the event itself. He talked a full 1h15min. I was disappointed that it really was kind of a walk thru the book. and same with the moderator who was asking questions after the talk… kind of chapter by chapter of the book. Seemed like very NOT good questioning. I really wanted to take over his seat and ask some REAL stuff! I realized this event was for alot of entrepreneurs. As I looked all around me, people were literally writing as fast as they could, as if to take down every word. It looked like no one had read the book yet. ??? I also felt I was one of the very very few there as a customer and long time Sbux lover. I said that to him (H.S.) as I passed him walking out….I wanted him to know I was there because of Sbux and what it meant for me, not because of some business dream I had, and wanted advice. (not that anything was wrong with that, either. just not me) But clearly, mostly that’s what it was. I was just thriled to have a few min. with Howard, and his signing my stuff, and a few words. He thanked ME as well. @denise r – between you hugging Howard and Melody buying all of the pens at the company store, I don’t know what we’re going to do with you two! 😉 Just kidding – wow, what a great story and a wonderful experience for you. @John – I read your book review and watched the “Vanguard Moments” slide show. I started writing a book length reply on website and decided that it would be better for me not to write a 10,000 word essay. I will say, it is true that Onward is a little easier to read if you can already picture and know the characters. Michelle Gass, and other members of the leadership team are mentioned at numerous points, but they don’t have a whole lot of “character development.” It helps a little bit to already know them, but not a significant impact on the book. @Melody … its more than knowing the characters, one has to be an insider to appreciate so many granular nuances about the Starbucks business. The Mastrena machine is a good example. Howard writes glowingly how the Mastrena machine is a dramatic improvement over the Verisimo. That’s inside baseball stuff that can’t appeal to many readers. 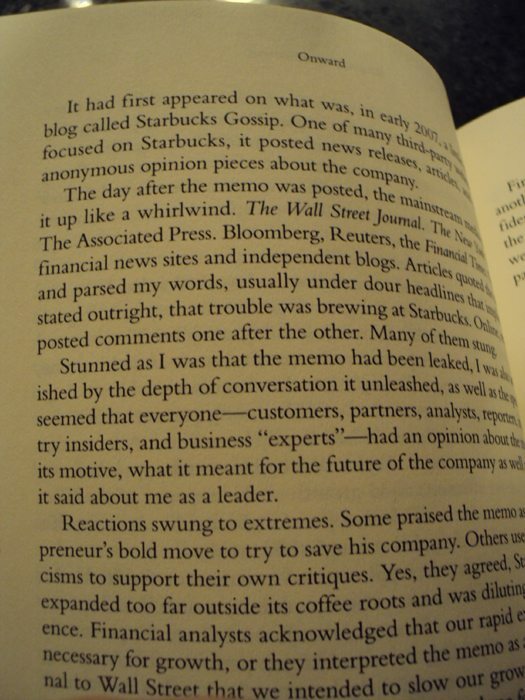 Also, did you find it odd Howard references himself as the founder of Starbucks? He says it directly on pg. 60 and insinuates it twice on pg. 38. I really liked the quotes and passionate comments from Howard on what it means to be a merchant. Those are VERY strong comments with lessons for many businesses. @John – Yes, I did find the references to him being the “founder” as odd. I’m sure he gets tired of correcting people in real life about that, and it’s hard to explain in a sound bite. Once in a while, he will very openly credit Jerry Baldwin, Gordon Bowker, and Zev (?) – On March 8, 2011, at the events (the portion open to the public outside the SSC on their parking lot in the afternoon) kicking off the 40th, he specifically said to the crowd (mostly all partners) that he is not the “founder” and reminded them all of the three founders, specifically naming each one. But yes, that seems like one of the less frequent things that he does, and he probably sees himself as the founder of the “modern Starbucks” and so accepts the title fairly easily. I wish I had captured him saying that in an audio recording on 3-8-11 but the audio segment I have from that day isn’t >that< exciting. 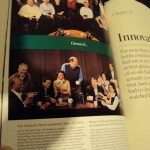 @john moore – I really liked your post as well as the extended version on http://www.brandautopsy.com. 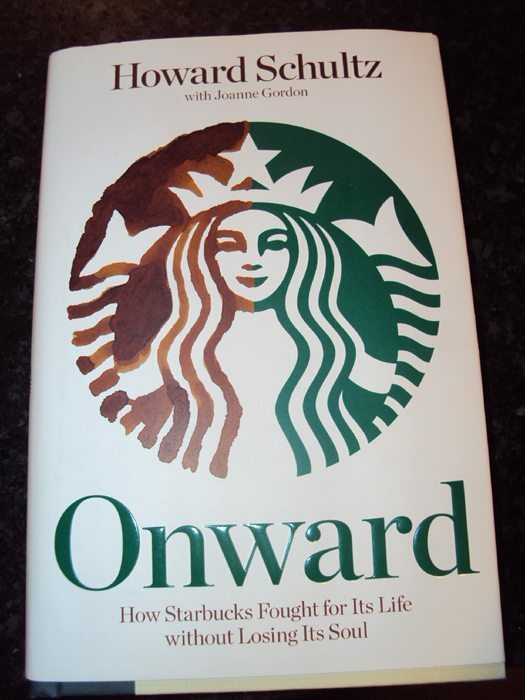 I’ve always had the sense that Onward was really about promoting a marketing message about a “new” Starbucks – something worked up in the PR/Marketing department more than Howard’s heart. 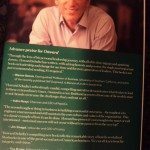 The insight you shared makes me want to add “HR department” too as there are several messages intended for partners and an attempt to help write the next chapter of Starbucks history the way Howard wants it remembered by all of the partners, who just so happened to have received a free copy of the book. However, you are also so very right that there are some “VERY” strong (or as you call them “VANGUARD”) moments in the book and those are the true take-aways. Howard is charismatic and can tell a great story. Thank you for pointing out some of the real substance. One more thing on the book, which I feel pretty sure would not so much apply to any partners who come to this site: I haven’t MET one partner yet who has read the book. Even the partner who was serving the coffee at the event yesterday…. no, hadn’t read it yet. I realize many of them are students so this book would be an unlikely choice maybe, esp. during exam time, but I really hope more of them are (or will be) reading it. They won’t know what they might or might not take away from it unless they read it. and @ Melody: can’t remember if I told you this yet: I was remembering later in the day one of the ways I mentioned you and your blog to H.S. : I was talking about getting the book and how first I’d ordered it thru Melody’s widget (he SEEMED totally aware) and then Sbux email, which came out late I thoiught (I told him) offering up the book with the card, so I did’t use that, but had then found out about the card with buying the book in a store so had to do that…. bla bla bla.. Anyway, for one sec. he might’ve heard me (inadvertantly, just honestly) saying: Sbux was too slow and Meldoy was on this first! which is true. @denise r I have also yet to find a partner who has read their book. The two managers I spoke with said “Who has the time” and a couple others just shrugged. @deniseR @Karldotcom – I’m surprised. So I’ve been asking around to partners in downtown, as I remember to do so, now and then. At my Columbia Tower Starbucks, the SM said that she hadn’t gotten to it yet, but was planning on it. At the same store, a very new partner at the register offered that she had started the book already and was reading it. At 7th and Pike this morning, I asked Danny, who IS an incredibly motivated near perfect partner, and he stated that he was nearly finished with the book, and he had been reading it with a “book club” guiding his friends through the book as they had questions about the details. I will ask a few more people when I get the chance. @KarlDahlquist – Funny you should say that about the key and Howard. I’ve heard tall tales that one of his standard inspirational speeches was the story of “I carry this key in my pocket …” but he seems to have given up on the romantic stories of Pike Place in favor of new stories of corporate turn arounds. There is an urban legend story of one day Howard decided to go for a run near the market. Howard ran in, threw a gym bag in the back office of 1912 Pike Place, and went for a run. A partner at 1912 Pike Place called the police, not recognizing the older stranger who oddly ran in, threw a bag in the office and ran out. The police arrive, only to realize that somehow no partner in the store had recognized it was HS. Now that story has been retold like 50th-hand by the time it got to me, so it’s probably part TALL-tale, no, wait, VENTI-tale at this point. I too find around here there is a huge indifference towards the book and it just sits there and have not found one partner that has showed any interest in it. Then my question is why write a partner version of the book? Sort of sad. re: partners (mostly, so far) NOT reading or the book, and/or barely showing any interest in it. As I maybe said before, I think it’s partly their age..they are, for the MOST part, not long time Sbux people. Mostly. But, too bad they apparently are not caring enough to check it out. At many many points in life, I think there is NEVER enough ‘time’ to read…you just do it. I also think they’re just not experienced enough, yet, to appreciate how drastically things come and go. everywhere. I asked one partner at the event I was at, who was serving the 🙁 PPR in the lobby outside the auditorium, 1) had he read the book? no. 2) did he get the leather bokmark with the book. He said he didn’t think so, he wasn’t sure. Maybe they were still in boxes in the back of the store they hadn’t opened yet. I really have still more to say about the book and its content but have to run…. more later. I have not found a partner who has read the book yet. One even gave me her copy knowing that I’d read it and she wouldn’t. I’ve heard a lot of “no time to read it” comments and a surprising number of “are you crazy” looks. @Hayley: it does seem there is more purely ‘business’ interest in the book than anything else. I realize it IS business, but there’s much more there. at least from MY point of view. The event that I was at (which was sent to me by Sbux Rewards!) definitely had that tone, I think that’s what maybe helped me appear (which I am) as a little something different (at the event) in Howard’s eyes, thankfully. While the lecture and talk and book, for that matter, are intersting from a purely business point of view, that wasn’t what mattered to me….. not the main thing. Actualy, I was sitting in my regular store earlier today with one of my favorite ‘3rd place’ friends and we were talking about running in Chicago (just had the infamous Shamrock Shuffle last Sunday, the world’s largets 8k….which was wayyyy too late…April 10th! for St Pat’s???? plus it turned out to be way too warm, nearly 90 with hot strong winds, even in the early morning. Anyway. (I told him I’d asked Howard if he’d run that morn. when I met him…Tues…a very pretty morn in Chi. for a run. H.S. said no, btw, he hadn’t) Anyway, this Sbux friend was telling me: he’s not interested in the book (he’s in his 50’s) and that the main thing about Sbux for him was “this”….the (‘THE’) experience…coming in, getting his coffee, reading, talking. the experience. I agreed..altho the coffee is pretty much right up there for me, altho, as has been said: coffee gets you in the door….. the rest is something else. That, especially, was what I wanted to tell H.S. from me that day…. I wasn’t there for ‘business’. It was about all my Sbux experiences. He seemed to give me a heartfelt ‘thank you’. I can’t believe partners haven’t read it. It takes an hour and a half. I read it the day I got it. It’s in story format. It’s an easy read. If you have trouble with a book like Onward don’t go into higher learning. Mind you Howard does have a bit of an ‘i’ problem. @DeniseR – That’s an interesting story about your mom reading Onward. I know that my mom would never get it all. She doesn’t step foot in a Starbucks. I would have told her that selling Via at Starbucks isn’t telling people to stay home any more than selling whole bean coffee. I think what is more shocking than Via is seeing bags of coffee being sold pre-ground! I finally DID meet a partner (in the most unlikely place…..we don’t usually communicate that much….in this store;( Anyway, I told him about seeing H.S. and that he signed my card etc. He got very excited, said he’d seen him ,too, at a partners event..where he did show up and talked the full 90min. He also told me (which I’d already heard) that he (H.S.) was a one minute in and out at one partners event, then he told me he was also a total ‘no-show’ at one of the Borders store “signings” and also a northshore book club. no show. yikes! I’m glad my experinece was at it was. I am really struggling with this book, it seems to artificial. It is implausible in my opinion, while I don’t doubt that things happened, I do doubt they happened in the way described in the book. I am only a 1/4 of the way through it, it is interesting, but it seems less than credible in my opinion right now.